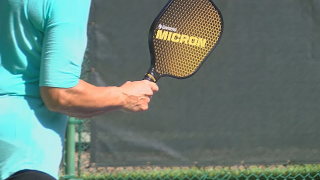 SAVANNAH, GA (WTOC) - Pickleball players will soon have the opportunity to compete and help a good cause. The first Special Pops Southern Motors Pickleball Tournament is looking for participants. The two day competition will be September 17th and 18th at the Landings. The tournament benefits the Special Pops organization, which works with intellectually disabled people and gives them tennis lessons. Organizers came up with the pickleball tournament when thinking of ways to raise money. "Instead of every year, begging for money, we should start a program that would have ongoing capabilities, and we came up with pickle ball," said Special Pops Executive Director, Ralph Ferrone.